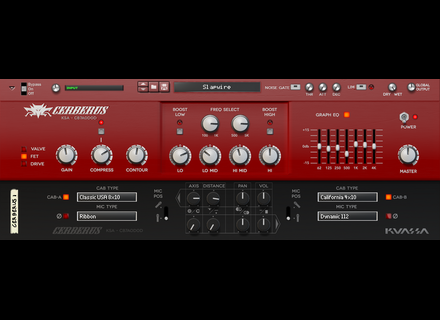 Cerberus RE, Software Amp Simulator from Kuassa. Cerberus is a three-channel bass amp which sonic versatility allows for use with any music style: you can choose between the warmness of a valve amp, the punch and clarity of a solid-state amp and a great amount of drive. The Cerberus GUI features a compressor, a Contour control, a DI, a wetness control, parametric and graphic EQs, as well as a noise gate, a dual-miking cab simulator with mono/stereo options and a CV input control. The Cerberus Rack Extension is available at shop.propellerheads.se for 39€, and Kuassa announces on its website that a VST, AU, RTAS and AAX plug-in version will be released soon for other DAWs on Mac and PC. 8Dio offers legato violin samples It is quite unusual from 8Dio but they are now offering a free Try-Pack of its new Agitato Grandiose Legato Violin Ensemble library. The Riser, a synth-based transition tool AIR Music Technology will launch on September 1st a new synth that you can now try for free if you download it today. Audio Assault launches a saturation plug-in Audio Assault keeps on developing plug-ins for big phat sound, and introduces the Headcrusher saturation plug-in.